American Iron Magazine is a publication for Harley Davidson motorcycle enthusiasts. The magazine features articles, news and reviews of Harley Davidson motorcycles, parts, gear, news and riders. Buy a single copy or subscription to American Iron magazine. American Iron Magazine is reportedly the most popular Harley magazine in the world. The magazine was founded in 1989. There is information on upcoming motorcycle events on a worldwide basis. There are how to articles, reviews of products and motorcycle gear, and great photography. 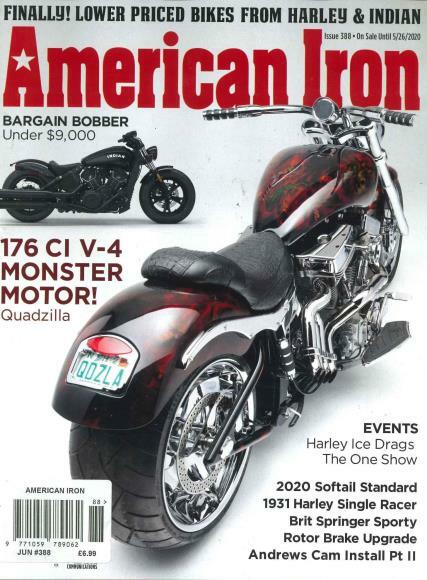 The magazine features American made motorcycles, specializing in Harley Davidson bikes but also covering Indian motorcycles and Big Dog Motorcycles. The technical articles in American Iron Magazine are written by experts in the field of motorcycles. Featured tech writers include Donny Peterson and Tom Johnson, who write about how to make motorcycle repairs, how to maintain your bike, how to fix classic bikes, and how to make a custom built bike. If you love American made motorcycles, and you want information on which motorcycle to buy, how to fix a bike, what parts to get, where to travel with your motorcycle, or you want to know what bike events are coming up then you need a subscription to American Iron Magazine.